A day after the Election Commission rejected his claims over the party's name and election symbol, Mr Yadav termed as "not in conformity with justice" its decision to recognise the group led by Bihar Chief Minister Nitish Kumar as the real Janata Dal (United) or the JD(U) and allow his faction to use 'arrow' symbol. 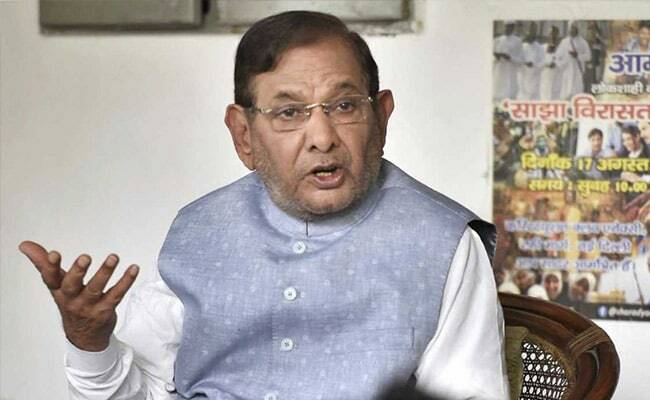 New Delhi: Rajya Sabha MP Sharad Yadav on Saturday said that his faction of the JD(U) will fight the Gujarat Assembly polls on the 'autorickshaw' symbol and in alliance with the Congress. Mr Kumar and Mr Yadav parted ways after the former decided to join hands with the BJP in July, triggering a battle for the control of the party. The EC, in its order issued yesterday, said the group led by Mr Kumar "has demonstrated overwhelming majority support" in the legislature wing as well as the majority in the national council of the party, which is the apex organisational body of the JD(U). "We don't have dearth of symbols. We keep ourselves prepared for the fight. There have been talks with the Congress about seats (sharing) for the Gujarat elections. It will be announced by the Congress party," Mr Yadav told a press conference in New Delhi. Asked about the new symbol his faction was going to adopt for fighting in the Gujarat Assembly elections, he said, it is the "autorickshaw". He, however, did not announce the name of his new party. Mr Yadav also raised doubts over the Moody's upgrading India's sovereign credit rating when the "Indian economy is in a bad shape and economists are endorsing the economic crisis in the country". Mr Yadav also criticised the government for allegedly making it mandatory to link Aadhar card to avail ration by the poor under the National Food Security Act.